Family rooms can be one of the most fun and busiest rooms in a household. It’s where everyone gathers to play games, make arts and crafts, watch television, listen to music and play with toys. It’s also the type of place that accumulates a lot of stuff, and if you’re selling a home and haven’t cleared out the family room, it’s time to get going. Over the years, old toys, board games, craft supplies, coloring books and all sorts of things can accumulate, stuffing shelves and storage areas beyond their capacity. But a family or play room doesn’t need to be messy. Following these steps can make your recreation area appealing while keeping it a place for family members to relax and enjoy themselves. It’s all fun and games: Board games are a great way for families to bond but take a look at those games you have. There are probably games you haven’t played in years, and others with worn-out boxes. Getting rid of games that aren’t being used is a great way to clear out the clutter. Instead of throwing them away, offer them to friends or relatives who have kids, or donate them to a local preschool. That’s entertainment: DVDs and CDs were a staple of family rooms for a long time, and you likely have accumulated many of them over the years. Get rid of DVDs your kids have outgrown and others you simply don’t plan on watching. In this age of streaming, you don’t need a giant stack of DVD boxes dominating a room. Same with CDs, which are becoming downright old-fashioned in the digital era. Places to donate these items include daycares, senior centers and libraries. Clear out the toys: Lots of toys go unused for years, and there are probably a lot of broken playthings in your kids’ toy chest. Get rid of toys the kids haven’t touched in years. Throw out broken ones and donate those that are in good condition. 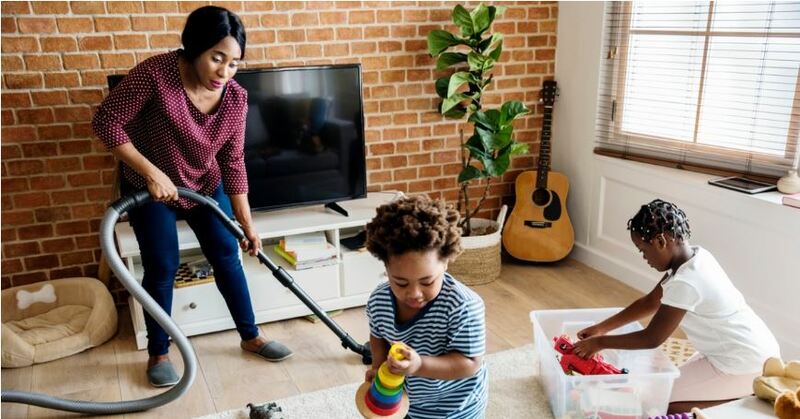 Clean up and tidy up: Now that you’ve gotten rid of all this stuff you don’t need, it’s time to freshen up your family space. Dust and vacuum, of course, but also organize. For storage, invest in bins and shelving and keep things neat—toys in one area, board games on shelves, etc. In the TV area, cut down on unsightly wires by discarding video game consoles that aren’t being used. Also, if streaming is dominating your TV watching, you may not even need a DVD player in the room anymore. In the end, you’ll have a space that will appeal to buyers, a place where they can imagine making their own special memories as a family.